He was reading The Isis Apocalypse, by former adviser to the US State Department on terrorism issues Will McCants. It explores the ideology of the terrorist organisation and is often used as a reference for journalists and researchers. That seems a perfectly reasonable thing for a journalist to be reading in order to understand the background to the Manchester attack, which Bercito had been sent to cover for his employer, the Folha de São Paulo newspaper. But it was apparently enough for the border police to pull him in for questioning. His passport and press credentials were taken away, and he waited for an hour before he was interviewed. The police officers then explained exactly why Bercito had been singled out for special attention: another passenger on his flight had felt "uncomfortable" about his choice of reading matter. To be fair, you can't really blame the Manchester border police for following up on that complaint, given the terrorist attack that had taken place in the city just 24 hours before. But it's a sad reflection of the effectiveness of the authorities' scaremongering that some members of the public feel the need to report someone because he or she was reading about ISIS. What next: reporting people to the police for watching TV reports about terrorism? Mr Brecito said they then returned his passport to him, but warned that "if they wanted, they could keep him for a long time". And they're right -- as David Miranda discovered the hard way. We've occasionally seen instances in the past in which educational institutions are threatened with trademark lawsuits or actually go through them, though those suits usually feature the worst trademark bullies out there (hi, Olympics!). Rarer is seeing some small business owner pestering schools with trademark disputes. Still rarer are cases in which those businesses are actually involved in the business of trying to promote education. Yet that's exactly what we have in the case of Springboards to Education, which has filed nine trademark suits against seven school districts, a non-profit, and a library. So far, the defendants include the school districts of McAllen, Pharr-San Juan-Alamo, Mission, La Joya and Houston, as well as the public charter schools IDEA and KIPP. The education nonprofit Teach For America is also included, as well as the library supply company Demco. Each lawsuit presents evidence of Springboard’s owner and creator Johnny Lopez’s trademarks, which include the phrases Millionaire Reader, trademarked in 2012; Read a Million Words, trademarked in 2011; Millionaire’s Reading Club, trademarked in 2012; Million Dollar Reader, trademarked in 2013; and Feel Like a Million Bucks, trademarked in 2015. We'll leave the non-profit and library aside for a moment, as I cannot say for certain that either are not engaged in any kind of commerce revolving around Springboard's trademarks. That said, the gall involved in suing schools for trying to get kids to engage in reading is matched only by the silliness of it. These schools should simply be able to stand up in court, inform the court that they are educating children instead of engaging in any sort of commerce, and that should satisfy the court as proof that none of them are competing in a marketplace with Springboard, rendering the trademark suit neutered. However, none of this kept Springboard from firing off a cease-and-desist letter to these schools, shortly before filing suit. At least one of the schools in question understands how trademark law works, it seems, and is preparing for the exact defense that I had recommended above. The district has already filed a motion to dismiss the claims, said school district attorney Ben Castillo, adding the district is not using any of its materials for commercial gain. Meanwhile, we now live in a world where a private business has sued a public school district in order to keep it from promoting reading to students in a specific way. Delightful. Mr. @KevinBankston recommends the book Make It So, about cross-pollination of UI between sci-fi and the tech industry. Any of y'all read it? For years, people have talked about how early Motorola flip phone designs were inspired by the Tricorder device in Star Trek, but the book appears to go much further in detailing lots of other examples. 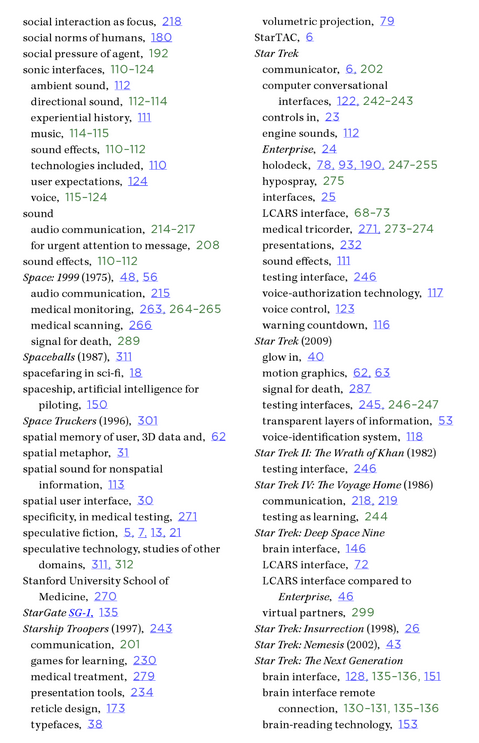 Hell, just take a look at one page from the index at the end: Looks like a fun read all around, and as I start to dig into it, I figured many of you might appreciate it as well. Traditionally, we all know that the end user license agreement is used to try and give companies all manner of legal advantages, while attempting (often ridiculously) to strip away ordinary consumer rights. Of course, the legally binding nature of these agreements is dubious, and nobody bothers to read them anyway. We've historically noted that occasionally companies bury something fun in the ocean of mouse print to make just that point. Years ago, anti-spyware firm PC Pitstop promised to give away $1,000 to the first person to e-mail them at a specific address (it took 3,000 downloads for that person to appear). "16. Special Consideration. A special consideration in material or immaterial form may be awarded to the first 100 authorized licensees to actually read this section of the EULA and contact LARIAN STUDIOS at info@larian.com. This offer can be withdrawn by LARIAN STUDIOS at any time." "We're telling you now because the results are in and it turns out that you in fact do read these things. Our lawyer feels good about this. He's also revoking the consideration because we're making him pay for every mail we get." Frankly, it's pretty astonishing that even that many users could be bothered to read the EULA. More frequently, the gaming industry (like all other industries) is obsessed with using EULAs to strip away consumer rights or make consumer-owned products less useful, so it's refreshing to see a company with a sense of humor. That doesn't make it any less true that the standard EULA remains a ridiculous, unread beast and that keeping it simple is a better bet if winning consumer hearts is anywhere on your radar. Like many people, video games have been an integral part of my life for about as long as I can remember. From my days visiting Wildcat! BBS systems where I'd play Trade Wars 2000 -- to obsessing over the Apple IIe, IIc and IIgs -- video games were not only an integral part of my childhood, they actually helped forge an adult career path. Swapping out graphics cards and building new PCs to play Quake 2 led to a job in Manhattan legal IT, which in turn resulted in a life focused on writing about technology. Aside from a few tics, I like to believe I wound up relatively normal, and video games have made my life immeasurably more rewarding. "I concede the point but say that it's two-dimensional, and that children should be exercising more than their mouse fingers. The other side asks why it's any worse than reading for hours at a time. Because, I say, reading allows you to imaginatively inhabit other minds. The opposition implies that this is just the latest moral panic, and that Stone Age elders probably thought the world was going to the dogs when people stopped just staring at the fire and started telling each other stories." "For some autistic children who have trouble with complex social interactions, Minecraft is clearly a good fit with its lack of intricate social cues and simple environment. But for many parents, the absence of that complexity, in a world where their children spend so much time, might be a reason to be wary." Whether it's Minecraft, apps or the internet at large, there is such a thing as parenting -- or paying attention to and understanding what your children are up to. Even then, in 1987 my parents certainly had absolutely no understanding of the world I was experiencing via the local Wildcat! BBS, yet those experiences opened an entire world of social interaction with like-minded individuals I never would have experienced otherwise as an awkward, socially anxious tot with painful new braces. That world taught me many things my parents never could have, but parenting in the brick and mortar world still helped me understand where social lines in this new frontier were drawn (with the exception of that time a 35-year-old BBS member called my folks to complain about their son's occasionally-barbed tongue). "...here’s a simpler way for parents who don’t feel they understand Minecraft to build their knowledge: sit down next to your child and watch them. Ask questions. See if they’ll teach you how to play it with them. This doesn’t mean you’ll avoid having to make decisions about the amount of time your child spends in Minecraft’s beguiling “hyper-reality” rather than the unblocky real world, but it does mean you’ll have a better idea – with less worries – about what they’re up to, and how it can fit into their life. Like so many things, actually bothering to understand something before you waste energy fearing it makes all the difference in the world. There are millions of kids for whom Minecraft is opening an entire world of enjoyable problem solving and social interaction, the benefits of which may extend into and across their entire lives. Stagnating this potential with fear because you couldn't be bothered to try and understand what your children are experiencing wastes more than just your time. It appears the National Highway Traffic Safety Administration (in conjunction with the White House Office of National Drug Policy) isn't done turning American citizens against their local police departments with its quest to determine what percentage of drivers are hitting the road while under the influence of drugs or alcohol. The claims made by both the NHTSA and Ft. Worth PD about this "survey" didn't add up. It was supposedly both "voluntary" and "anonymous." But drivers who refused to participate had their breath surreptitiously "tested" by Passive Alcohol Detectors, which means at least one aspect wasn't "voluntary." And those that did agree to give blood or saliva had to sign a release form, which knocks a pretty big hole in the "anonymity" side of it. Furthermore, having law enforcement officers ask nicely for cooperation tends to make "voluntary" experiences feel more "mandatory." A sign posted before the checkpoint could have pointed out the survey was voluntary, but one would imagine this sort of notification would have eliminated the desired "randomness" the NHTSA was seeking. I assume we'll be hearing more about this in the next few days, but it appears the NHTSA Blood n' Spit Road Show has moved on to Reading, Pennsylvania. Police there joined forces with the Pacific Institute for Research and Evaluation — a company hired by the National Highway Traffic Safety Administration and the White House Office of National Drug Control Policy — to conduct the road stops. This doesn't seem to have made some locals very happy. [E]ven though the drivers were told their provision of DNA was purely voluntary, many complained about the insistent quizzing and overall feeling of pressure — and that they were pulled to the side of the road in the first place for a research project, the Reading Eagle reported. “I feel this incident is a gross abuse of power on many levels,” said Reading resident Ricardo Nieves, in a complaint to the town’s City Council earlier this week, Fox News reported. But it appears as though the Reading police chief won't be apologizing any time soon for lending out his officers (and their perceived authority). Reading Police Chief William Heim said to the Reading Eagle that federal authorities are only trying to determine the extent of drunken and drugged driving statistics as part of an overall fight to lower road crashes and driving-related injuries. And he said the cheek swab requests weren’t aimed at collecting DNA but rather checking for the presence of prescription drugs, Fox News said. Moreover, he claimed police only served as security and weren’t actually pulling drivers to the side or asking questions. This survey may not be aimed at collecting DNA, but it's not as though it's not being collected along with the blood and saliva. Other than protecting the cash box (donors are awarded $10-50, depending on which fluid is volunteered), it would seem a truly voluntary survey wouldn't need much in terms of "security." What sending police officers does do, whether intentionally or not, is provide the surveyors with more participants by lightly applying the color of authority. Chief Heim, however, seems either blissfully ignorant or deliberately ignorant of the effect adding a "police presence" has on a situation. Asked about Nieves' statement that the private firm wanted police there for intimidation, Heim responded: "People are not pressured by police presence to do something they don't want to. Only a cop could give that answer with a straight face and only a cop would. Every single day people are pressured to do things they don't want to -- or things they don't feel they should need to -- by people in positions of authority. A uniform and an imbalance of power go a long way towards eliminating the resistance shown by average citizens. Only the tenacious escape the hundreds of purely voluntary situations ("would you mind popping the trunk for me?" "would you mind pulling ahead to the inspection area?") that arise everyday. Most people simply give these officers what they want, even when the officers themselves know they have no right to ask for it. There will be more fallout from the NHTSA's latest bodily fluid "survey" stop. There will be more in the future as it continues around the country. And accompanying it all will be the assertion that adding police officers into the mix has zero effect on the public's perception of these "voluntary" surveys. We've talked about procedures within the Defense Department to block computers from accessing the website for The Guardian newspaper -- along with similarly short-sighted moves to apply a sledgehammer approach to pretending that public information isn't really public. I've heard from a few people within the Defense Department who defend this approach on basic procedural grounds of trying to "make sure" that classified info remains classified, but the real problem is considering any publicly revealed documents as still classified. As I've said each time this debate comes up, in the business world, the equivalent situation involving trade secrets or non-disclosure agreements almost always are recognized as null and void if the info becomes public through other means. However, that's not the way the government works. The latest is that Homeland Security sent around a memo warning employees that merely opening up a Washington Post article about some of the leaks might violate their non-disclosure agreement to "protect National Security Information," and it even says that merely clicking on the story might make the reader "subject to any administrative or legal action from the Government." Got that? Working for the government and merely reading the news about things the government is doing might subject you to legal action. At least someone in Congress realizes the insanity of all of this. Rep. Grayson, who displayed the very same NSA slides that DHS is warning its employees about in Congress itself, has offered up an amendment to the Defense Appropriations Bill, stating that nothing in the defense appropriations should be used to block employees from reading the news on their own time. None of the funds made available by this Act may be used to restrict the access of members of the Armed Forces to publically available online news media during morale, welfare, and recreation periods. While this is one way to deal with the problem, I still think you solve a lot more problems with a basic recognition of reality: if classified documents become public, they shouldn't be considered classified any more, because (a) that's stupid and (b) it actually hinders the ability of government employees to be as knowledgeable as everyone else in the world. Also, Grayson's amendment only applies to the members of the armed forces, but not to civilian employees of the Department of Defense, or any employees of Homeland Security, who are subject to the crazy threats above. As the MPAA and other copyright maximalist organizations continue to try to block the WIPO copyright treaty for the blind, which will make it easier for blind people around the globe to be able to access creative works, I was touched by this incredible video from Ron McCallum, the former dean at the University of Sydney Law School, where he is now an Emeritus Professor. McCallum has been blind since birth, and in the video he talks about how technology changed his life and allowed him to do so much -- and how important the treaty in question is, to allow that same revolution to help others, especially in less developed countries. It's touching and entertaining at the same time, and should make you wonder why the MPAA wants so badly to reject this treaty. Obviously, the MPAA doesn't hate blind people, but they're so ridiculously scared of any expansion of the rights of the public (things like fair use) that they'll block any and all moves in that direction, even if the collateral damage means that other Ron McCallums around the globe won't be able to have the wonderful experiences that he did. Every technological advance is greeted as some point during its life cycle (usually as it approaches ubiquity) by the disgruntled arguments of people who prefer older things or methods. Never has this been more prevalent than in the digital era. People diss mp3s for their sonic limitations, which is fine, but then they go a step further, claiming the "real" way to listen to music involves using other, older technology. There's an emphasis on the physicality of the product, as if it were somehow more "real" simply because you can leave greasy fingerprints on it, thus lowering its resale value. Certain authors have argued this adamantly over the recent years, proudly declaiming the superiority of the old school, dead tree book. Apparently, there's nothing like picking up an odorous book (smells like real) whose binding glue has slowly disintegrated over the years, causing the pages to scatter across the floor and sending all those helpful book scorpions scuttling off in search of a new home. That's real. That's reading. This stuff you do with your eyes on screens? Your brain might tell you it's reading, but it's nothing of the sort. Fortunately for those of us who believe otherwise, Andrew Piper has visited Slate to set us all back on the path of touchable righteousness. In a lengthy post that reads like a dry historical text populated with anti-tech non sequiturs, Piper decries the falseness of reading books on a screen, because if you can't physically touch it, it's just not real. Amid the seemingly endless debates today about the future of reading, there remains one salient, yet often overlooked fact: Reading isn’t only a matter of our brains; it’s something that we do with our bodies. To think about the future of reading means, then, to think about the long history of how touch has shaped reading and, by extension, our sense of ourselves while we read. At this point, the history lesson begins. 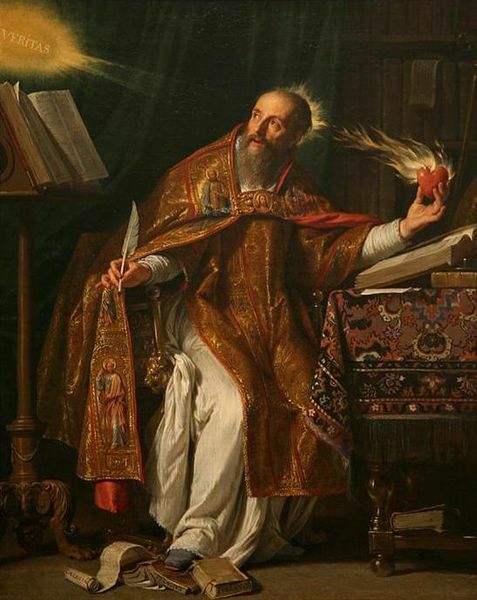 The first witness on the stand in defense of "touching is reading" is none other than St. Augustine, whose conversion to Christianity was a defining moment in "hand-to-book" reading. At this moment, he tells us, “I had no wish to read more and no need to do so. For in an instant, as I came to the end of the sentence, it was as though the light of confidence flooded into my heart and all the darkness of doubt was dispelled.” Augustine closes the book, marking his place with his finger, and goes to tell his friend Alypius about his experience. His conversion is complete. Bookmarking. Completely unavailable or at the very least, not the same! Score one for St. Augustine. There's much, much, much, much more history where that came from, weaving together a very long narrative that basically states "humans have hands and like to touch stuff." Along the way, you'll meet all sorts of historical figures (Eugene Delacroix! Faust! Abraham Ortelius!) It's an essay of appropriately essay-esque length. If I'm reading this correctly (though I suppose I am not, since I'm reading it on an LCD screen), the rise of ebooks will finally allow us to shed our uncomfortable skeletons and return, spineless and triumphant, to R'lyeh to awaken Cthulhu from his long slumber. Most people call them ebooks. Piper's article seems to go beyond the normal arguments about aesthetic preferences and move towards touting the moral superiority of print, simply because your hands can touch and feel paper and it's different than touching and feeling an electronic device. E-readers are not... physical enough. And because of that lack of physicality, reading is no longer as real. Riding a bike today isn't nearly as real as it was, what with not having to worry about your crotchal region and forearms being pounded mercilessly by the combination of solid rubber tires, no suspension system and a lack of decent pavement. Driving a car lacks the coarse physicality of driving a team of horses across dusty plains in search of a Slurpee and a pack of smokes. Watching a movie isn't nearly as "real" as watching a good old fashioned play, where actors were actual, physical human beings close enough to touch and/or interrupt with an ill-timed coughing fit/incoming call. For that matter, making an outgoing call is simply a matter of pressing some fake buttons (or simply mashing a thumb on a fake face in the Contact list). Our forearms and dialing finger have atrophied from under-use going all the way back to the days when friends with the most 0's in their numbers got the fewest calls. Today's cold scientific medical community, with its beeping machinery and wires everywhere can never be as real as it was in the past when the common cold was treated with a combination of leeches, heroin and a full frontal lobotomy. Firing up your local newspaper's website will never be as real as paging through the paper version, admiring the ink stains on your fingers and the box scores informing you that the game ended after press time. The website also can't offer you the physical pain of multiple scratches (picked up while retrieving the paper from your overgrown rose bush) or multiple bite wounds (picked up while retrieving the paper from your neighbor's Rottweiler-infested backyard). Nuking a quick meal for the kids? Get over yourself. Real people start their own fires from scratch, by doing whatever it is that Boy Scouts do to earn the "Firestarter" badge. And that Healthy Choice meal? Better get right to slaughtering your own flavorless chicken and growing some equally flavorless rice to accompany it. Writing an email can't possibly compare to the physical purity of placing quill to parchment and hand-scratching a lengthy URL onto it, along with "Yo, Ted. Check thiſ out." Buying stuff with a credit card online vs. biting gold pieces into "bits" at the trading post, online classes vs. sleeping through Philosophy in an uncomfortable chair, and etc. ad nauseaum. While I'm not sure what version of the web Piper uses (Web 0.85b?) that follows "prescribed pathways" (mine goes pretty much anywhere with very little provocation), that's not really where the error lies. The book isn't the "shared column of support," Piper. It's you! Why would you sell your own importance short? My kids like to be near me, too. It doesn't matter if we're reading a book, streaming something on Netflix, watching someone do something funny/stupid on YouTube or slinging Angry Birds across the screen. The important thing isn't the physicality of the object. It's the shared experience. To attribute this to something made of glue, paper and ink is ridiculous, and to further claim that a shift to electronics is robbing us of a part of our humanity even more so.